I'm so glad I found these sugar skull table textiles. I would love to have a more elegant sugar skull themed Halloween party. 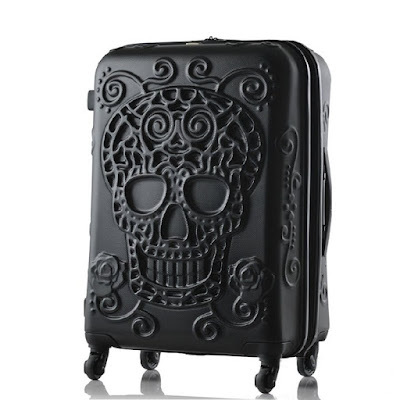 Don't misunderstand, I love the bright and cheerful Dia de los Muertos skulls, but those are everywhere. I want something a little more unique and dreary this year. I am pretty sure I'm going to have a more intimate gathering with a few select friends this year. These would be a great way to decorate! Hopefully you have a darker dining room table for this lace sugar skull table runner. I think it wouldn't look as sinister on a light wood table. The skulls would pop if it was dark! 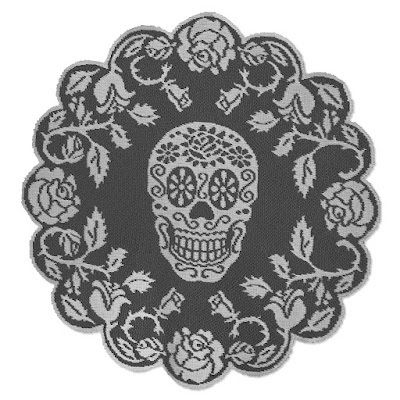 I confess, I would use this lace pewter sugar skulls round doily every day! I like how the skull looks like it is evilly staring at you. It's creepy, but still a stunning piece! 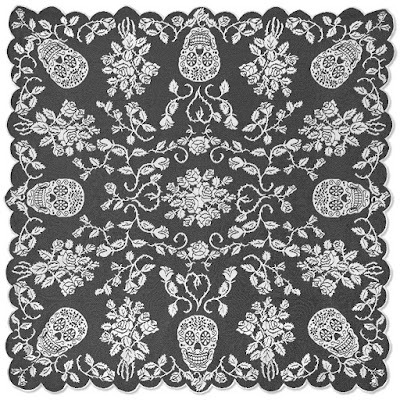 Instead of decorating the whole dining room, you could use this lace sugar skulls table topper for a small table in the living room. Too bad it wasn't shaped more like webs then it would be extra scary! I think these are gorgeous, don't you? Not only that, but I can see myself using these all year around. For certain guests of course. Take a look at more sugar skull table textiles. Heritage Lace has some amazing stuff for those who love lacy Victorian styles! Comment below and tell me what you think! I absolutely have to make sure this adorable Take Along Haunted House (Amazon) makes it under my Christmas tree this year - or better yet, under my Halloween tree! I've always been more of a Playmobil person than a LEGO person, anyway. I totally will play with this on rainy autumn and winter evenings! I'm also enchanted to learn how to say Haunted House in French, "Maison hantee." 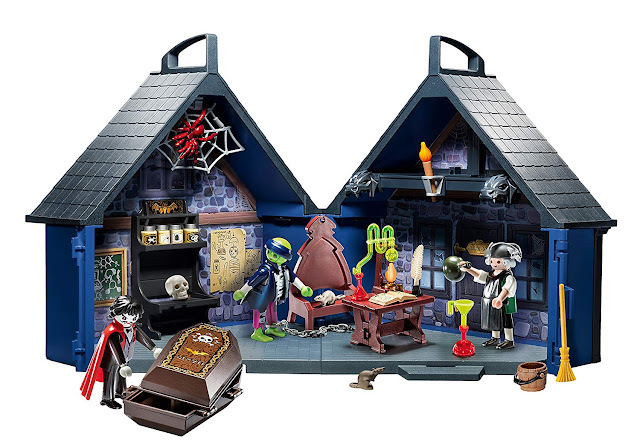 The Playmobil Haunted House includes a vampire and his coffin, a mad scientist and his potions, and a monster. The set also includes a couple of rats, a skull, a spider and its web. You can also pick up the Playmobil Take-Along Haunted House on eBay.Happy Halloween! Today I'm meandering about Etsy, admiring all the various ways seamstresses have incorporated the Nightmare Before Christmas theme into their little costumes and dresses for kids. Jack Skellington Inspired Tulle Dress Victorian Inspired Jack Skellington Dress Little Miss Jack Dress Jack Skellington Inspired Tutu Dress Jack Skellington Tutu for Infants Jack Skellington Corset Dress for Babies Jack Skellington Inspired Dress for Toddlers Jack Skellington Tutu DressHappy haunting, little ones!